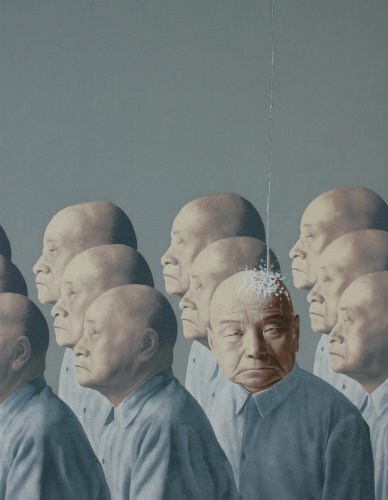 Trained in the art of engraving and having worked in the publishing industry, Chen Yu chose to become a painter to focus on creating a world of his own and to work by himself among his works, almost like traditional Chinese painters. 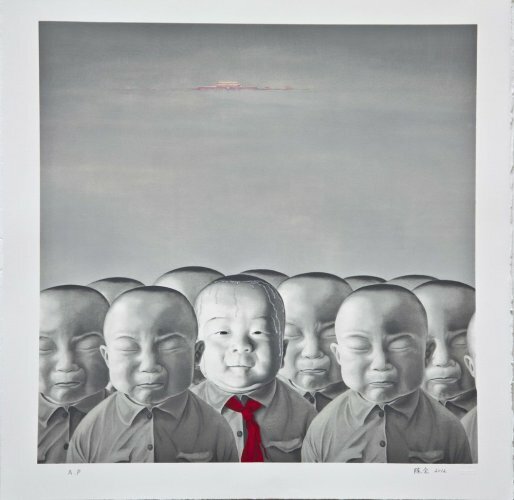 Influenced by the art of printmaking, Chen Yu differentiates himself with the monotony of his subjects, which are cloned as if they were reproduced by the printing press. 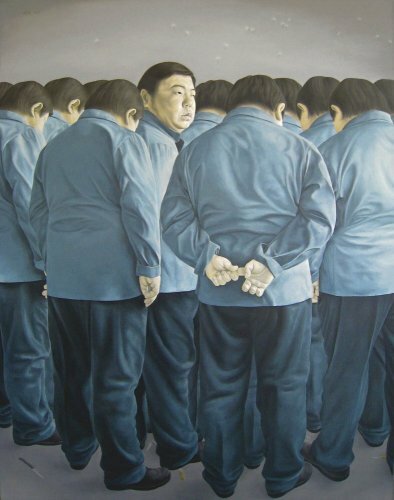 Rows of duplicated human heads are a constant symbolic feature in his paintings. Their repetition questions the place given to individuality and its expression. In some series of works, only one protagonist has his/her eyes open. The portraits repeat with boredom, with the figures looking detached from each other and forlorn, while among them one figure looks on. 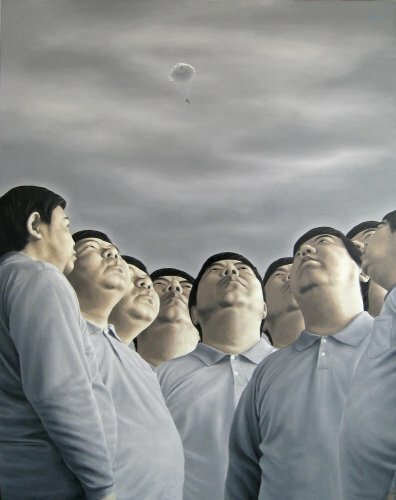 The artist’s sense of humour is perceptible in the way he illustrates individuality. The gestures or expression of the singled out character is most of the time hilarious. Sometimes picking one’s nose, water being poured on one’s bold head, looking at the spectator with a cigarette in one’s mouth, etc. are examples of such attitudes the artist picks to make one person among his created crowds stand out. Above the figures, a single motif absurdly floats in the composition, breaking this monotonous pattern by bringing the attention away from the human subjects. Over the years, his style and technique have matured into more realistic aesthetics, still crisp but with more accomplished renderings and a more subtle colour palette. 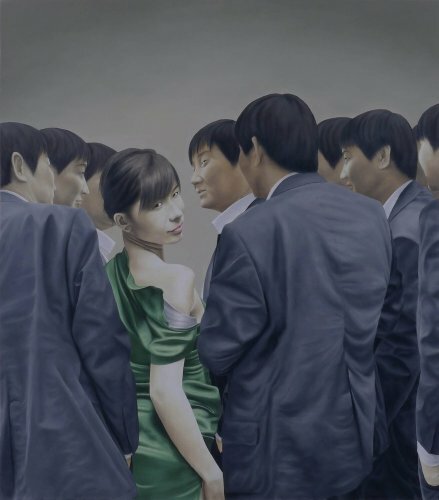 In recent works, Chen Yu explores individuality in new ways, the difference between the characters are shown in gender, outfits, and facial expressions. 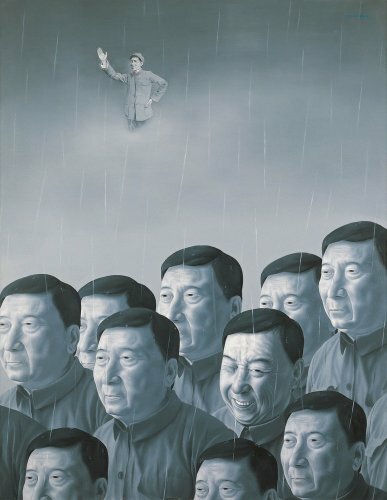 The figures appear to be more related, less isolated and if one individual is distinguished, the others seem to interact with him or her - their eyes are open.